This recipe is a variation that I created using all the ingredients from a French recipe, a classic of the kitchen. 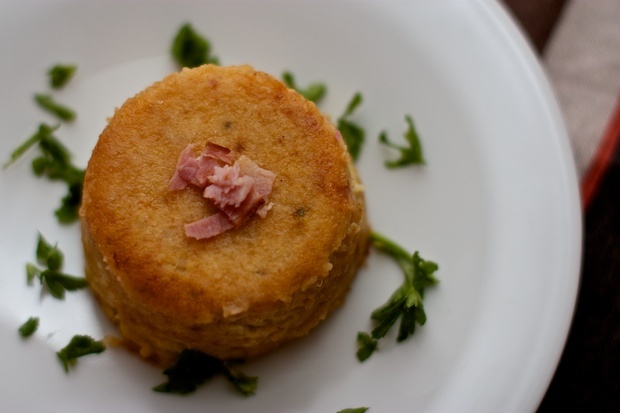 This small savory cake is soft and can be useful to help those who usually do not love cauliflower. In winter it is very important to reap the benefits of this vegetable (see its benefits in the Garden section). Given the presence of milk, eggs and ham, this tortino can become a full dinner and not just an appetizer. Heat the milk. In a saucepan, add the melted butter and add in the flour, mixing thoroughly. After a few minutes the flour will take on a golden color, then slowly add the milk, stirring with a whisk so that no lumps are formed. When the cream has assumed a thick consistency turn off the heat. Mash the cauliflower with a fork, pour into a bowl, add all ingredients and mix thoroughly. Butter 6 individual ramekins with a little butter and bread crumbs. Divide the mixture into molds and introduce in a preheated oven at 350F for about 20 minutes. It should form a golden crust. Turn off the oven, remove the patties and let rest for at least a quarter of an hour. Introduce the blade of a knife between the cake and its container in order to facilitate the detachment. Turning over each stencil on a serving plate, tap the bottom so that it will come out without breaking. Garnish with parsley and if you want, a few pieces of ham. Posted in Appetizers, Recipes. RSS 2.0 feed.